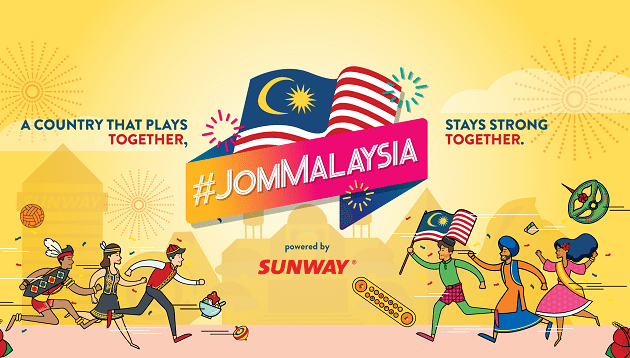 Sunway Group’s is treating patriotic Malaysians and fans of nostalgia to an all-immersive Malaysian experience this independence day with its inaugural #JomMalaysia carnival. The event will run from 31 August to 1 September in front of Sunway Resort Hotel and Spa in Sunway City Kuala Lumpur. The carnival features five experiential spaces – Flavours of Malaysia (Food), Voices of Malaysia (music), Cultures of Malaysia (dance), Arts of Malaysia (arts and crafts), and Games of Malaysia (games). It is conceptualised in collaboration with creative agency AdAsia and supported by Astro Radio. According to Tan Sri Razman M. Hashim, deputy chairman of Sunway Group, the carnival was created as a tribute to the nation’s “Sayangi Malaysiaku” campaign, showcasing the diversity of Malaysia’s heritage and culture. In a statement to A+M, Jane Poh, Sunway Group’s senior general manager, group brand marketing and communications, said the carnival is a community outreach initiative and hopes it will raise awareness about the diverse arts, culture, and historical heritage of Malaysia. Promotions for the #JomMalaysia carnival will be done through digital channels in order to target Millennials more effectively. “The collaboration between Sunway Group and Astro Radio will definitely help us to reach out to a wider audience as its radio stations has the potential reach of 15.8 people weekly and 30.4 million monthly unique visitors,” Poh said. The group also produced a theme song titled “Suara Malaysia”, which will be played across all 17 Astro Radio stations, including ERA, HITZ, MY, MIX and LITE, among others. The official music video will be released on Sunway’s official Youtube and Facebook on 20 August. An “Evolution Tunnel” at the entrance will transport visitors through a historical timeline showcasing Malaysia’s rich historical heritage. The tunnel will also showcase Sunway’s transformation from its early mining days into a multinational conglomerate today, very much in tandem with Malaysia’s progress as a nation. Foodies will be able to sample a variety of Malaysian favourites such as nasi kerabu, laksa, rojak and cendol, as well as snacks of the 70s and 80s including White Rabbit Candy, Haw Flakes, Biskut Piring and Apollo Chocolate Wafers. Dance afficionados will get to experience Malaysia’s diverse cultural heritage through sublime performances by ASWARA Malaysia. Vocalists and musicians from the Malaysian Buskers Club will also be present to perform a repertoire of original and cover songs. Meanwhile, Malaysians can relive their childhood through traditional games such as congkak, batu seremban, teng teng, lompat getah, sepak bulu ayam and eraser battle. Visitors can also support young Malaysian entrepreneurs by treating themselves to a wide selection of artisanal crafts and fashionable trinkets. Uniquely Malaysian arts and crafts, clothing, accessories, toys and rattan-made items will also be displayed within booths, epitomising Malaysia’s pre-independence architecture. “We hope that this will be a nostalgia-inducing experience for everyone which will strengthen their love for the country through cultivating a deeper understanding of our history. To know Malaysia is to love Malaysia,” Razman M. Hashim added. What's up with DBS' quirky marketing choices? Thai beauty brand Oriental Princess is encouraging Thai women to “save the moment” in their relationships. .. Does the communication hype “avoid the elephant in the room” as it leaves out all indication of consumption decline?..